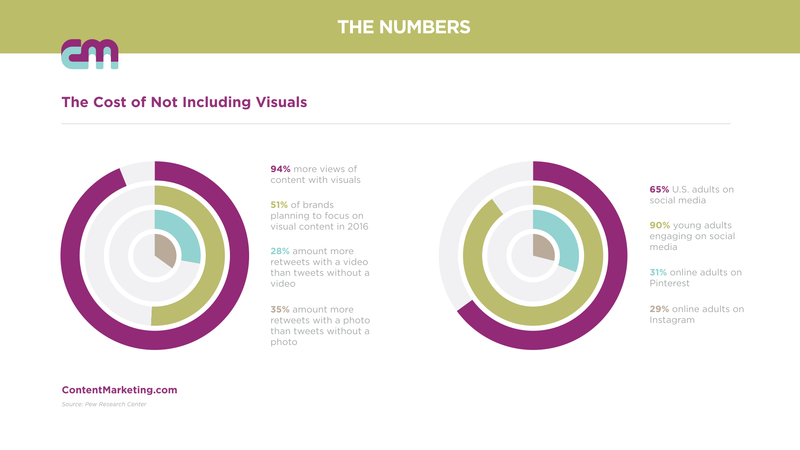 Adding visuals will become even more important for content marketers in 2016. Words are everywhere in our daily life – text messages, social media, blogs. But a picture, graphic or video can often change an entire piece of content. Its catches our attention, adds context, clearly illustrates a point and even adds emotion. After we are done reading or watching, we have a visual image to associate in our mind with the story. Research backs this up. According to Forbes, content with visuals gets 94 percent more views. Regardless of what exact measure companies use to measure return on investment – conversions, leads or social shares – it all starts with page views. The bottom line is that a piece of content will not be a success if people do not see it. Because of the increased success of visual based content, companies are responding by focusing on creating both visual based content and including images in text-based content. According to the Content Marketing Institute Content Marketing B2B Benchmarks, Budgets and Trends Report – North America, 51 percent of brands are planning on focusing on creating visual content in 2016. This means brands that do not have visual content will be at an even bigger disadvantage and likely to see page views decrease against competitors using visuals. While simply using a stock image in a blog post is better than nothing, marketers find infographics and video to be especially effective. Hubspot found people are 30 times more likely to read an infographic than text. But companies shouldn’t forget about video. In a survey by Adobe, over half (51.9 percent) of marketing professionals said video was the form of content marketing with the highest ROI. One of the cheapest and most effective ways to increase your content’s reach is to get other people to share your content with their followers. Research shows people are more likely to hit the Share button if the content contains at least one visual element. Twitter found that tweets with a video got 28 percent more tweets and those with a photo got 35 percent more. Focusing on creating content that increases social shares is becoming especially important since the Pew Research Center found 65 percent of all U.S. adults are on social media, with 90 percent of young adults engaging on social media. Additionally, several popular social media platforms are visual based and must have an image associated with the post. Without visuals, brands miss out on these avenues, which are especially popular women and young adults. Pinterest is used by 31 percent of all online adults and Instagram is used by 28 percent of all online adults. By taking the time to create content that is visual-centric such as infographics and video, as well as adding images to text-based content, your content will be more likely to be viewed, remembered and shared.